A fan club of South Korean star actor Jang Keun-suk has thrown a charity photo exhibition to celebrate the star's birthday, a local promotion agency said Tuesday. To celebrate Jang's 29th birthday, some 1,500 fans from home and abroad visited the two day event, held on Saturday and Sunday at the gallery in Cheongdamdong, central Seoul, according to the celebrity event promoter Ytree Company. Displayed in the exhibition are photographs of Jang, in addition to adorable artwork dedicated to the South Korean singer-actor, who has a large fandom throughout Asia, especially at home and in Japan. 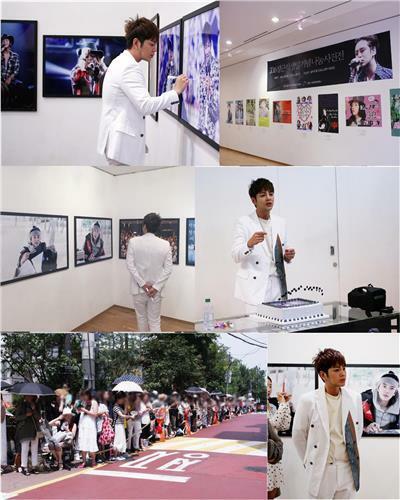 Cri J, the exhibition's host and official fan club of the globally followed actor, raised a total of 50 million won (US$45,000) through the event. The fan club will donate all of the funds raised to local charity organizations. Cri J has made the event an annual celebration for the past four years. Jang showed up at his birthday event and attended a birthday party with the fans. "(This event) let me look back at my activities and memories of the past 12 months," Jang thanked the crowd at the exhibition. Jang will be hosting "My Ear's Candy," a new entertainment show on television cable network tvN, that will kick off Aug. 18.